The floating tap fountain is a clever illusion. It consist of a faucet mysteriously hovering above a pool or basin with an endless supply of water gushing out of it from seemingly nowhere. The faucet remains surprisingly steady despite having no visible support and where is all this water coming from? This spectacular effect is achieved by a transparent tube in the middle of the water column that holds the tap in place and, at the same time, keeps feeding it with water pumped from below. The water goes up through the tube and exits at the top. The water column, which is usually turbulent, effectively hides the tube from view. 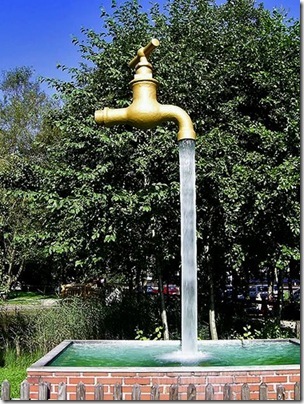 Several giant floating tap fountains can be found around Spain, Belgium, US, Canada and other parts of the world. Some are permanent installation, others are temporary art pieces. The one below is located at Aqualand, Puerto de Santa María, Spain.